No, the subject of this post is not the famous Seminole warrior (whose name is spelled Osceola), but rather an African-American washerwoman named Oseola McCarty (1908-1999) who spent most of her 91 years in Hattiesburg, Mississippi. I first read about her several years ago, but her story entered my consciousness again last week. My family and I were driving through Hattiesburg on our return from vacationing in Florida, and, as we passed the campus of The University of Southern Mississippi, I spotted the words “Oseola McCarty Hall” above the entry to a beautiful dormitory building. How did a stately building on a major college campus in the Deep South come to bear the name of a black laundry lady? Oseola McCarty and her mother moved to Hattiesburg from nearby Wayne County when she was a little girl. She left school during her sixth grade year so that she could care for a disabled, childless aunt. Oseola would never have an opportunity to return to school. As a very young woman, Oseola began taking in laundry to help supplement the family income (her mother worked as a cook) and to support her grandmother and her aunt. Oseola never married and had no children. Her grandmother died in 1944, her mother in 1964, and her aunt in 1967. For over 75 years, Oseola McCarty washed and ironed the clothing of well-to-do residents in Hattiesburg, working for as many as three generations within some families. Oseola worked hard. She worked and saved. She didn’t expend much income for her own upkeep. She maintained a modest frame house, never owned a car (she pushed a shopping cart over a mile each way to do her grocery shopping), picked up broadcast TV stations on her black and white set, and made do without air conditioning in the steamy Gulf Coast heat. As the years rolled on, bank personnel began to notice the size of her accumulating savings and offered her counsel and assistance in protecting and investing her money. In 1995, Miss McCarty met with a bank official and an attorney for whom she had worked for years and informed them that, while she wanted to leave some money to her church and a few relatives, she wanted to leave the bulk of her estate to Southern Miss for scholarships, primarily for African-American students who could not otherwise attend due to financial hardship. “I’m too old to get an education,” she said, “but they can. They used to not let colored people go out there, but now they do, and I think they should have it!” What an amazing, selfless, forgiving spirit! The bank official placed dimes on her kitchen table to represent tenths of her estate, and Oseola identified where she wanted the money to go: 10% to her church, 30% to her relatives, and 60% to Southern Miss, a gift of $150,000 to the university! 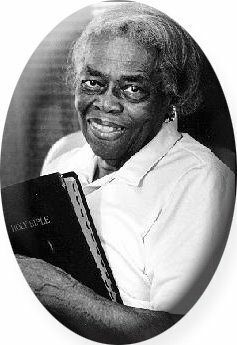 Oseola McCarty’s gift made international news. In the four years that followed, prior to her death in 1999, Oseola received an honorary degree from Southern Miss (the first of its kind in school history), an honorary doctorate from Harvard, the United Nations’ Avicenna Medal, and the Presidential Citizens Medal, the second highest civilian award in the U.S. The new dormitory was posthumously dedicated in her honor in 2002. The endowed Oseola McCarty Scholarship continues to provide needed financial assistance to deserving students. About her gift, Oseola said, “I can’t do everything, but I can do something to help somebody. And what I can do I will do. I wish I could do more.” Wow! I wish I could have known her. And I pray that I can become a lot more like her! This is so sweet. It nearly has me in tears. I have posted a comment below that was made on my original blog post by Paul Laughlin back on September 9 after I had shifted Thinking Out Loud over to WordPress. I just found it the other day and wanted to include it here. Mr. Laughlin was the officer from Trustmark Bank who met with Miss McCarty to discuss how she wanted to distribute her estate. Thanks, Paul, for taking the time to comment and for providing the additional information and clarification.